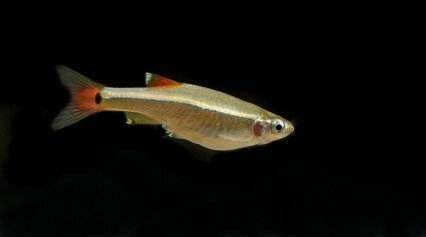 The White Cloud Mountain minnow was the first aquarium fish I kept. I bought six and kept them in a 35 l/7.7 gal tank with pea gravel and an air-powered undergravel filter. In hindsight those were less than ideal conditions for Tanichthys albonubes, with virtually no flow, cramped conditions and poor quality food. The most famous location for these fish were the fast flowing and cool streams of Baiyunshan Mountain —also known as White Cloud Mountain — in China where it was first discovered in 1932 by Shu-Yan-Lin. The species was already on the verge of extinction, and is now considered extinct in this area, but it is very easy to breed in captivity. White clouds are also plentiful in many other parts of China, Vietnam and Taiwan, apparently in part due to the release of captive specimens. I wanted to mimic the fast flowing brooks on Baiyunshan Mountain, but could not find any images of the streams. Yet the use of smooth boulders and pebbles with interesting white veins looked natural and interesting. 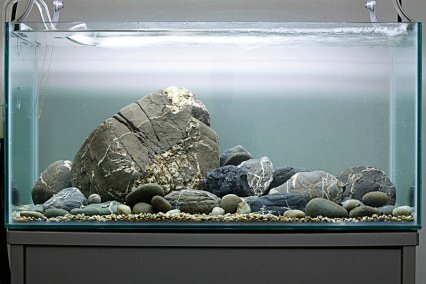 Having river sand as substrate, pea gravel and pebbles around the rocks add further interest. All the boulders and pebbles I collected myself. I used a handful of gravel from an old set-up and river sand is cheap to buy. 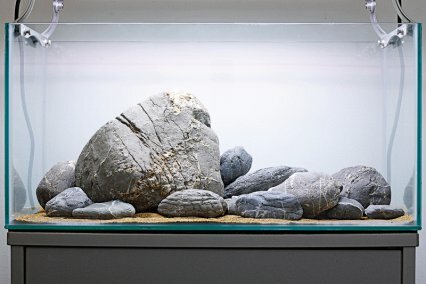 The whole tank took less than two hours to set up and photograph and shows that an impressive look can be achieved without breaking any bank! I did use a powerful external filter to help mimic the fast flowing water and lifted the filter outlet just above the line of water to help aerate it even further. The fish are inexpensive, tolerant to a wide variation in temperature and water chemistry — making this biotope an ideal project for newcomers. This is not necessary though and an internal filter would be fine. 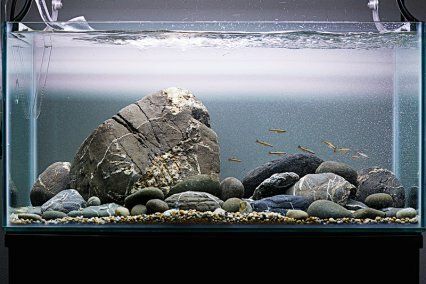 Remember to fishless cycle the tank or use an existing mature filter before adding new fish. Although White Cloud Mountain minnows are very hardy, needlessly exposing them to toxic ammonia and nitrite is cruel. They adjust well to wide ranging water chemistry, but if your water varies considerably from that of the shops then take longer to acclimatise the fish. I have used some high-end equipment on this set-up but it can be replicated at a fraction of the cost. Here’s how much you can expect to pay if on limited resources. 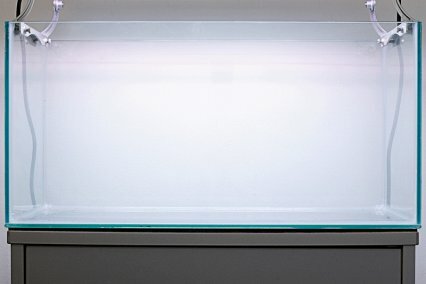 Go for a 60 x 30 x 30cm/24 x 12 x 12” 54 l/12 gal aquarium. Mine has no braces or rims, making it ideal for overtank lighting. It has 6mm thick regular float glass with clear silicon. Your local shop can order one for you from the manufacturer, for around £25. A thin layer of river sand is added. This looks very natural and is inexpensive. This acts as a support for the boulders and there are no plants, so the depth of sand created is left minimal to prevent anaerobic bacteria creating a stagnant substrate. 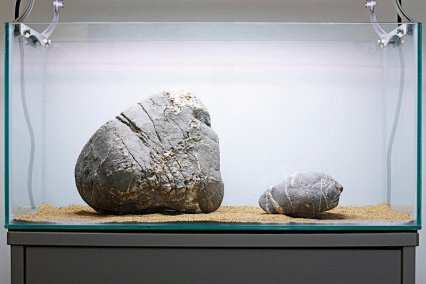 The biggest boulders for the tank are positioned using a guide called the golden ratio, or rule of thirds. This makes them look more aesthetically balanced in the set-up . It is a compositional trick in creative disciplines, including aquascaping and photography. Smaller boulder and pebbles are added around the main boulders. Consider the way the pebbles lay so they appear natural. In fast flowing streams the water will have eroded the stones, so think about that when positioning them. The remaining smallest pebbles are added. Pea gravel is added around their base. The whole effect looks natural and the varying sizes create a pleasing transition from fore to background. Later on I remove some pea gravel to reveal the sand underneath, further enhancing the layout. De-chlorinated tapwater is added gently via a colander to help prevent disrupting the sand and gravel. My tapwater is quite hard (GH 14, KH 7 with a pH of 7.5), making it ideal for the fish and no heater is necessary for Tanichthys albonubes. crystal clear. I also use a glass inlet and outlet, but these are not essential. An inexpensive internal filter is fine for this set-up. The aquarium is fishlessly cycled before I add 12 White Cloud Mountain minnows. They are fed two to three times daily on dried, frozen and a quality flake food. One quarter of the water is changed each week and the filter cleaned in old aquarium water every month. For an even more stunning display you could add some moss to the stones. Most mosses do best in cooler temperatures with plenty of flow. The fish may even use it as a spawning ground. Prune the moss regularly to encourage healthy growth and help prevent detritus building up. Adding algae-eating shrimp such as Caridina multidentata keeps the moss clean. These may not be biotope specific but a little artistic licence is allowed! Distribution: Very rare in wild. All specimens in trade are captive bred. Temperature: Tolerant of a wide range of temperatures from 5-26°C/41-79°F, but does best between 18-22°C/64-72°F. Diet: Quality dry foods, frozen brineshrimp and Daphnia. Gender: Males are slimmer and more brightly coloured than females. Breeding: Egg-layer, so use spawning mops. Dropping the temperature, via chilled water during water change, can induce spawning. Matt Clarke answers some common questions on White Cloud Mountain minnows and their relatives. When did White Clouds first become available in the fishkeeping hobby? They were discovered in 1932 and first made it into the German fish trade in 1938, so they’ve been around for ages. They were dubbed the Poor Man’s Neon tetra. Some of the White Clouds I have seen have long fins. What are they? These are a selectively-bred aquarium strain and they can develop quite long flowing fins. There is also a golden form. Neither occurs in the wild, but their care requirements are the same. Captive-bred stocks vary in quality, with some showing strong colours and others looking quite dull, so shop around to get the best fish. Are they difficult to breed? No, they’re very simple for an egg scatterer. Use a 45cm/18” tank with an air-powered sponge filter and a bare bottom and a wool spawning mop suspended from the surface. Add a male and a single plump female from your main tank and leave them to spawn. The pair will usually spawn after a couple of days and you’ll probably see them at it, as the spawning can span an entire day! Once they’ve deposited their eggs in the mop, return the parents to the main tank. Tiny fry will appear after two or three days and need to be fed on a very small food, such as infusoria, initially. Once a little larger, you can then wean them onto other foods. Keep changing the water and syphon out any uneaten food to keep the tank clean, and you should soon have a young shoal. Are there are other fish in the same genus as the White Cloud? Yes, there are two others. The Vietnamese cardinal minnow, Tanichthys micagemmae, was described by Freyhof and Herder in 2001 from the River Ben Hai in Vietnam, while Tanichthys thacbaensis was described by Nguyen and Ngo in the same year. The Vietname cardinal minnow has already become a popular aquarium fish and is a good alternative to the White Cloud if you want to create a Vietnamese biotope. By contrast, there’s barely any information available on T. thacbaensis. In a recent paper highlighting the conservation status of the White Cloud, which also mentioned micagemmae, thacbaensis was ignored. How can I tell the difference between White Clouds and Vietnamese cardinal minnows? You can tell by the stripe coloration. The White Cloud is brown below the lateral stripe while micagemmae is paler, often with tiny dark spots. The two black and white lateral stripes in micagemmae are of roughly equal width. The black stripe is about 0.9-1.8 times wider than the white stripe here, while in albonubes it’s 0.3-0.6 times as wide. The stripe is also lower down on micagemmae than in albonubes. Thanks to the Wildwoods Mail Order Tropical Fish Service for supplying the fish used in this set-up. All arrived safe and well. TThis item was first published in the December 2009 issue of Practical Fishkeeping magazine. It may not be reproduced without written permission.